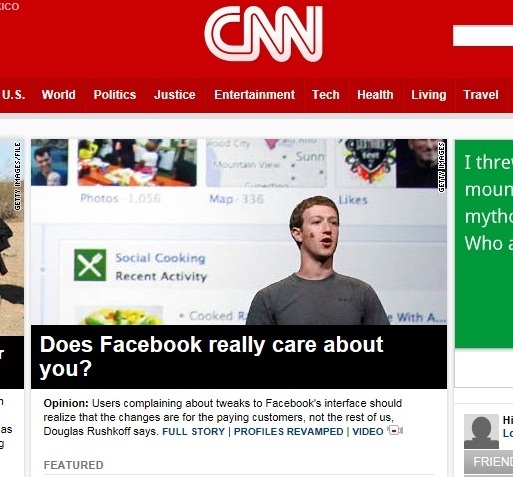 Seriously… can you believe this retarded article was on CNN’s front page? What a bunch of idiots! But wait… I think I know this Douglas Rushkoff guy… Of course, he was the winner of the column of the week some days ago! Facebook doesn’t care about you if you complain that a free service made some changes you didn’t like. Facebook does care about you in the sense of wanting to satisfy you so that you will spend more time on their site so they can make more money in advertising. It’s funny how people feel so entitled to their free use of a service provided by a profit-seeking private company. Companies don’t like or dislike anyone because they are just that: companies. Does IBM care about you? How about Toyota? Of course they all want to sell their stuff but they don’t care about you as a person. And that is not bad! It is just a different kind of relationship. People like Rushkoff want to guide their lives on feelings and not rational decisions. They need to feel loved and love (most usually hate) everything, including companies. That is the path to liberalism and insanity.